The Ab Doer is an abdominal machine that works the abdominal muscles aerobically. You can use the Ab Doer to help you tone, trim, and tighten you abs without doing situps. 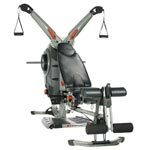 The Ab Doer Pro ab machine uses a unique and patented flexibility allowing you to effectively exercise your abdominal muscles. Involving exercises using simple leaning and twisting motions, the Ab Doer Pro model helps reduce waistline and also increase lower back flexibility - all these exercises are performed sitting down on the ab doer. 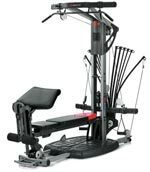 The Ab Doer features a pull-pin adjustable, high-grade padded steel platform seat along with thick foam rubber padded back tri-roller and grips, offering added comfort while exercising. With the leaning and twisting motions, the Ab Doer Pro works your mid section including your side oblique muscles, targeting your upper, lower abs, and also obliques. 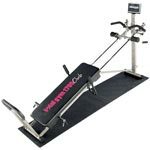 The AB-DOer Pro mobilizes the whole entire midsection working those muscles for fat burning and body shaping. John Abdo is Ab Doer Inventor. The ABdoer is easy to use and most of all it's effective! Works your abdominal muscles in a comfortable seated position. Padded rollers massage your back as you exercise. 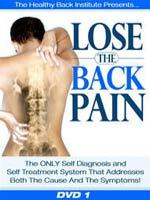 Ergonomically designed to take pressure off your spine. For many of us getting on the floor to do sit-ups or crunches is a task in itself. It can also be one of the greatest deterrents to achieving the fabulous-looking waistline that you've always wanted. With the AB-DOer Pro 2004 you can achieve your dream waistline in just minutes a day. With the Ab Doer Pro, you also receive Ab Doer Video. The fun, easy-to-follow videos allow the Ab Doer workout to grow with you. From beginner, to intermediate to advanced, the videos all consist of continuous anaerobic and aerobic exercises, designed to work the abdominal, oblique and lower back all at the same time. The ab doer video show you ways to burn calories, tone abdominal and oblique muscles and strengthen back muscles, combining aerobic exercise with toning and strengthening to get the waistline you've dreamed of.